For those Media Center 2005 users that are still using Media Player 10, Microsoft released an update to address Windows Media Player 10 automatic update failures after installing Update for Windows XP Media Center Edition 2005 (KB913800). A more recent version of Windows Media Player is already installed. Note This issue also occurs when you click Check for Player Updates on the Help menu in Windows Media Player 10. You can download the fix directly from Microsoft Downloads at the following link, and more information about the fix can be found at its Knowledge Base article (KB926251). In response to the article 'More HOV lanes planned' published on the Wednesday, December 13, 2006 by the Toronto Star, while I believe creating more High Occupancy Vehicle lanes on the 400-series highways (including the Queen Elizabeth Way) is a good start, more aggressive action should be taken, especially in the Greater Toronto Area. The Highway 401, with its Collector/Express lane system presents a unique opportunity where a tolling system would work in a manner more acceptable to the public. A toll on the Express lanes would still allow for people who don't want to pay tolls to travel the system via the Collector lanes. Transit vehicles, delivery trucks and emergency vehicles would be exempt from any tolls. Users would have a choice in whether they want to pay a toll or not; the highway would still be usable by those that don't want to pay a toll; and the movement of goods through Southern Ontario via Toronto is not compromised. The money raised through these tolls could go toward 400-series highway maintenance, and also become another source of funding for public transit all throughout Ontario. It would not be too costly a venture to implement this proposal, as existing infrastructure is essentially in place. Electronic tolling stations, similar to those on the 407 Express Toll Route (ETR), could be set up where the 401 Express lanes start and end, as well as all transfer points between the Express and Collector lanes. Hopefully the Ontario Ministry of Transportation has considered an idea similar to my proposal as something they could implement in the future. It would kill a few birds with one stone. Nintendo has announced that it is offering to replace the original version of the wrist straps on the Wii Remote with a newer, stronger version. This essentially applies to people who were first to get the Wii, as consoles shipping starting in early December already come with the newer version of the strap. To see the difference between the two straps, see the following picture. 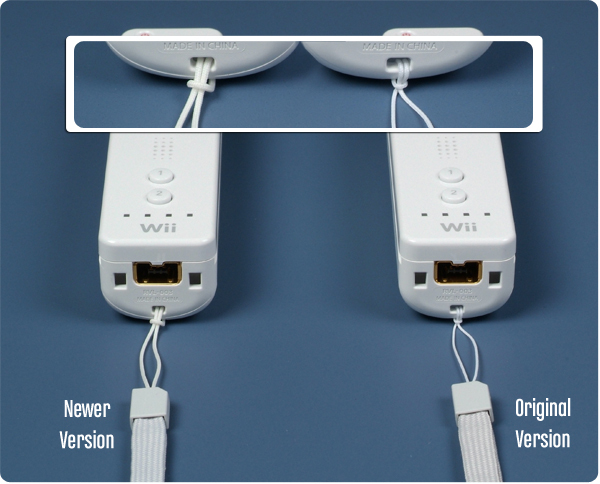 If you have the original version of the wrist strap, you can order the newer version at Nintendo's Wii Remote Wrist Strap Replacement Request Form. You will need your Wii serial number, as well as a valid e-mail address to order these new straps. Nintendo expects to begin shipping replacement straps around December 21st. It will take 5 to 9 days for delivery depending on your location. Until then, Nintendo advises you to follow their recommendations listed at the Safety Information for Playing Wii web page. The Toronto Transit Commission recently announced plans for revised subway service along the Bloor-Danforth subway line weekends in Feb/Mar 2007 in order to perform necessary major structural repairs to the tunnel roof between St. George and Bay stations. As a result of this revised subway service, people who are on the eastern portion of the Bloor-Danforth line (between Kennedy and Museum stations) during Saturdays and Sundays from February 18 to March 31, 2007 will have an opportunity to see Lower Bay subway station. Lower Bay station sits below the current (Upper) Bay station. It was open to the public for six months, when the Bloor-Danforth subway opened in 1966. Originally, the Bloor-Danforth subway line was 'interlined' with the Yonge-University subway line. The operating arrangements of this setup had a train starting from Eglinton Station, going around the loop via Union, turning left after Museum and going through upper St. George Station before getting onto the Bloor-Danforth line and arriving at Keele. This train would then reverse direction and take the Bloor-Danforth line all the way to Woodbine (via lower St. George and upper Bay) before reversing direction again, taking the wye through Lower Bay Station, returning to the Yonge-University line and heading back to Eglinton. A single disabled train was enough to bring the entire subway system to a halt. Passengers had difficulty deciding which trains to take at either St. George or Bay stations. The TTC surveyed its passengers about this subway arrangement, and the results of that survey, coupled with the effects of the abovementioned two issues, convinced the TTC that interlining the two subway lines was more trouble than it was worth. As a result, the two subway lines were separated and Lower Bay station was taken out of commission and closed to the public. Over the years, Lower Bay station has since been used as a setting for film companies to shoot subway scenes. Examples of movies that used this station include the 1995 film 'Johnny Mnemonic' and the 1990 film 'Darkman'. In addition, the television show 'Due South' also used this station as well. The station has also been used to test new subway signs, to test platform improvements, and to store used equipment. Those traveling on the Bloor-Danforth line can still catch a glimpse of the station from the front-end window of a westbound train just after leaving Yonge. Others may have heard of the station as part of urban infiltration stories that have been posted on various internet sites. For those of you that want to see this long lost station, you will have your chance on Saturdays and Sundays from February 18 to March 31, 2007. Hopefully the TTC will advertise this opportunity for the public to see a piece of its past. It would seem to be an easy way to gain a few extra fares, in addition to allowing people to see something that would normally be off-limits. I know I plan to check it out, you should as well if you have the opportunity. Update: February 24, 2007 - See here for details about Lower Bay and its inclusion into Doors Open Toronto 2007. We all know the story about V1 Extenders and how they won't work with Vista (see previous blog postings, V1 Media Center Extenders vs. Vista and Additional Information on v1 Extenders/Vista for that story). However, another question that has come up recently in the newsgroups and TGB forums is whether upcoming V2 Extenders would work in Media Center 2005. The Media Center Extender Platform Adaptation Kit enables partners to build Extenders for use with Windows Vista. Because Extender technology is a superset of the PlaysForSure device program, these devices will also be able to connect to Windows Media Connect/Windows Media Player Network Sharing running on Media Center 2005 PCs. They will not, however, connect to Media Center 2005 as Extenders. Note that when I say V2 Extenders, an Xbox 360 would, for all intents and purposes, not be considered to be a V2 Extender, as it will, in many scenarios, exceed what a V2 Extender can do. I would further elaborate on this, but unfortunately, I don't have any information that I can publicly disclose at the moment. Xbox 360 will work as an Extender on both MCE 2005 and Vista. My recommendation? Get an Xbox 360. For more information about V2 Extenders, visit the MCX Partner site. They may have more information to release (however, it would likely be under NDA). Rocher chocolates, made by the company, Ferrero (otherwise more commonly known as Ferrero Rocher) are one of my favourite chocolates. They are reasonably priced, and the taste and texture presented by each chocolate makes it quite an enjoyable experience, at least to me. Delicious, distinctive Ferrero Rocher fine hazelnut chocolates. The unique combination of creamy chocolate and a perfect whole hazelnut that is wrapped in a light, crisp wafer shell, covered in smooth milk chocolate and sprinkled with hazelnut pieces. Savour the Ferrero Rocher taste experience anytime! I could eat these things pretty quickly; however, when I am bored, I typically like to deconstruct these chocolates and eat each part of it separately. This is probably the engineer part of me breaking through; after all, I was in an engineering program prior to becoming an urban planner. After taking it out of the golden package, I proceed to carefully peel off the first layer of chocolate and hazelnut to expose the wafer shell. I dispose of this outer layer of chocolate and hazelnut into my mouth. Next, I break the wafer shell into its two halves to expose the inner chocolate and hazelnut. Not going to waste, the wafer shell finds a home in my mouth. An attempt to liberate the hazelnut ensues, as the chocolate is orally removed. Lastly, the freed hazelnut is devoured, and all is well until the craving for the next piece of chocolate kicks in. To further demonstrate this deconstruction of the Ferrero Rocher chocolate, here is a summary picture. Do you have your own special way of eating this chocolate? I would love to know if others enjoy their Ferrero Rocher chocolate in this manner. Some of you may have noticed that when you are viewing your Scheduled Recordings listings, the date format doesn't show the day of the week. Others, depending on their settings, may not have any problems seeing this. Media Center uses the long date format that is defined in your Regional and Language Options Control Panel. For some formats, the day of the week is not shown. As an example, English (United States) shows the day of the week in its Long date format, but English (Canada) and English (United Kingdom) do not. There are other formats that also don't show the day of the week in its long date format. You can see this in the below two pictures (focus on the Long date item). Change the long date format so that it includes the day of the week. Change the Current format to one that does have the day of the week (i.e. English (United States). Most people will likely want to do the former, so here is how you go about fixing it. Add the letters that define the 'Day of the week' (dddd) to the Long Date format. Once this is done, Media Center will show the day of the week in the Scheduled Recordings listing. Hit Ok to accept out. After doing this, the Extender will have the new Date format enabled on its account. This method will always work; however, I have sometimes seen that the date format change once you have changed it for another user (even though logic would dictate that it not change). YMMV. Hopefully you find this useful. On a side note, I wonder why English (Canada) and English (United Kingdom) don't have the day of the week shown in the Long Date format? I don't think it is because we have an aversion to seeing it? Anyone have a plausible explanation for that one? Microsoft has made available software and information to enable Microsoft Hardware devices to work with Windows Vista. Mouse (IntelliPoint) and keyboard (IntelliType) Hardware beta device software for Windows Vista is now available. Webcam (LifeCam) software to work with Windows Vista will be available in January. Fingerprint Reader software posted is final, not beta, software. Final software for keyboards and mice will be available by end of December 2006. For more information, see the Microsoft Hardware Windows Vista Support website. Update: December 09, 2006 - Intellitype Pro and Intellipoint are now out of beta. See the blog entry, Intellipoint and Intellitype Pro Final for Vista released, for more details.